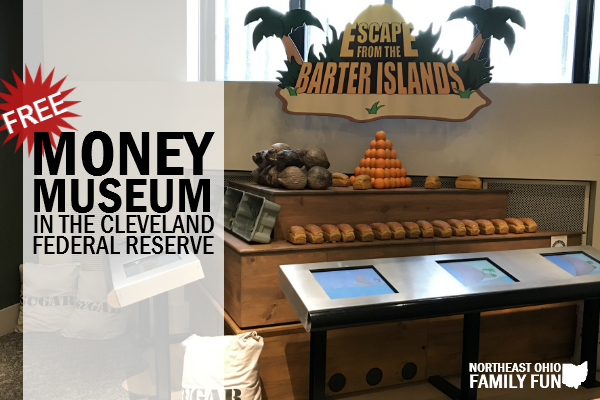 Located inside the Cleveland Federal Reserve, the Learning Center and Money Museum is fully of interactive exhibits where you will learn about the history of money, try to identify counterfeit bills, make your own currency and more! When you first enter the Federal Reserve, you will be amazed at how beautiful it is inside. After you check in at the security desk a museum attendant will explain the history of the Federal Reserve, details about the architecture or the building and will show you to the Money Museum. 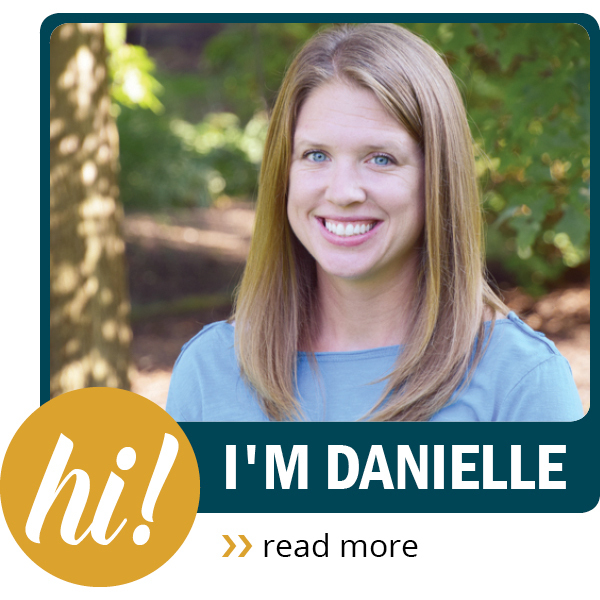 Helpful Tip: Make sure to bring a photo ID for anyone over sixteen. You will need it when entering the building. In addition, any bags you have will be screened before you enter. 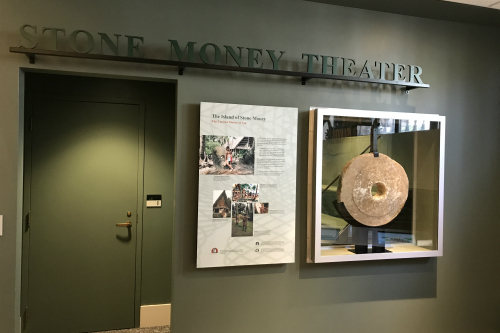 The Money Museum is full of interactive exhibits. 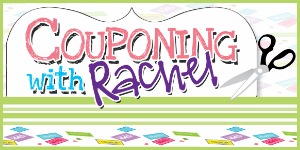 You'll learn about bartering and play a fun game testing your skill. There is also a short video that explains the history of money. Helpful Tip: To watch the video in the little theater, you need to push a button on the wall under the tv screen. Otherwise all you'll see is a powerpoint presentation. You'll also have the opportunity to test your skill at identifying counterfeit bills, see a 23 foot tall money tree, make your own money (using paper and crayon rubbings) and you can even put your picture on a 1 million dollar bill (which you can email to yourself and have them print you off a paper copy). Overall, you can easily spend between and one and one and a half hours going through the museum. At the very end be sure to stop by the information desk where they will give you a free goodie bag to take home. 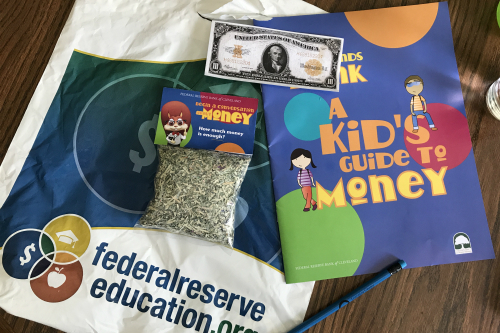 It includes a pencil, activity book and a bag of shredded money. Great museum for elementary to middle school aged kids. It has a lot of interactive activities. Plan to spend an hour to an hour and a half there. The closest parking are the public parking lots and parking garages located on East 9th Street. It's just a short walk to the museum from there. Expect to pay around $10 to park. Make sure to bring a photo ID for anyone over sixteen. You will need it when entering the building. In addition, any bags you have will be screened before you enter. To watch the video in the little theater, you have to bend down and push a button on the wall under the screen. Otherwise all you'll see is a powerpoint presentation. Armored trucks make frequent deliveries and pick-ups at the Federal Reserve. You can watch them go in and out of the side of the building. It's interesting to watch because the sidewalk raises and lowers for them. Definitely not something you see everyday. If you go with a group of 10 or more, call in advance and schedule a tour of the Federal Reserve. These book up quickly, try to call 3-6 months in advance. There are a number of places to eat within a block of the museum. We had pizza by the slice for $1.75 right across the street and it was delicious! 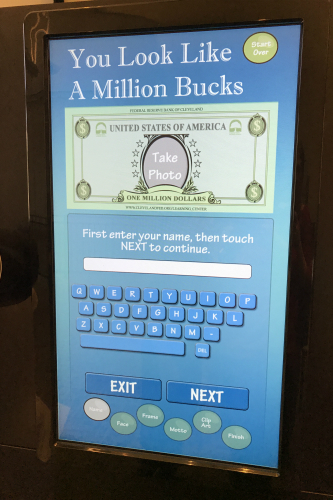 Have Tips or Comments about the Money Museum in Cleveland? Leave a comment below to let us know. Thanks! Open Monday – Thursday, 9:30am to 2:30pm. Closed bank holidays and occasionally closed for special events.